It's Saturday morning and I've made a quick dash into B&Q (Home Depot in the US?). Heading for the checkouts I become aware that there are none open, not a single one. Someone armed with a spreadsheet and some graph paper had worked out four self-service checkouts can fit in the same space as ones manned by humans AND they can save the staff costs by getting their customers to scan their own items. A great idea (actually no). Not only this but they fitted them in a store that has never had more than half the checkouts open (does not need the space) and two members of staff were required to help and pacify the irate builders forced to scan their loads of bricks and numerous heavy items and placing them on the weight-sensitive box designed to lessen theft. Of course using my rare gift I had managed to select two items without bar codes and rather than looking them up in a book (as would happen at any normal checkout) a staff member was send to obtain the numbers. He simply swapped the items for ones with codes so it's misery for the next person to select them, and groundhog day for the other staff. All this to save the cost of two minimum-wage staff. The cost to their business of dissatisfied customers and negative WOM must cost thousands. This reminded me of the website thisisbroken and the funny Seth Godin video on the same riff (the series/parallel taxi rank example is great). I know it's broken, the shop-floor-level B&Q staff know it's broken, how much custom will B&Q lose before management realise it's broken too? 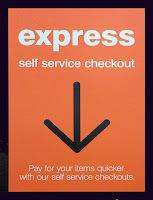 Express checkouts (which sort of imply it's quicker for you to do things than for trained staff) - great for cornflakes, less so for concrete. A self-confessed customer advocacy obsessive, Robin has worked in just about all marketing disciplines, previously managing the HP EMEA customer reference programme and now having a fine time leading the inEvidence customer advocacy team; more reference pros than you can shake a stick at. Melissa is a refreshingly honest reference professional, with an eye for detail that borders on obsessive – even a Sunday afternoon read of The Times can bring her out in a sweat if the punctuation’s not up to scratch.Having worked with a cross section of clients from the world's largest technology company to the world's smallest, Melissa has an uncanny knack of instinctively knowing what will work for clients and what won’t. Our day job comprises imagining, creating, managing and executing customer reference programmes; having a fab time working with brands you know and love. We do this as part of the inEvidence team within Insight Marketing & Communications; based in the UK but working globally. Any opinions stated are probably worthless however are 100% our own.